Takeaway: Aerogel coatings maintain efficiency after weathering, showing consistent thermal performance and corrosion protection. Andy Hoffman is affiliated with Tnemec Company and can be contacted using the options on the right. For info on how we work with industry partners click here. To learn more about aerogel coating systems check out the Insulating Coatings Powered by Aerogel Particles webinar presented by Andy Hoffman. Moisture is one of the major factors to consider when investigating corrosion under insulation (CUI). Accumulating water within an insulation system can wreak havoc on metal piping, ventilation and other insulated surfaces, originating from a variety of sources, including condensation within the systems, water spray from deluge systems, drift from cooling towers, process leakage or rainfall. (For more about the causes of CUI see An Introduction to the Root Causes of CUI.) But moisture can cause another problem while it goes untreated: a weakening in efficiency. Regardless of the cause, once the insulation gets wet there is a significant impact on efficiency. 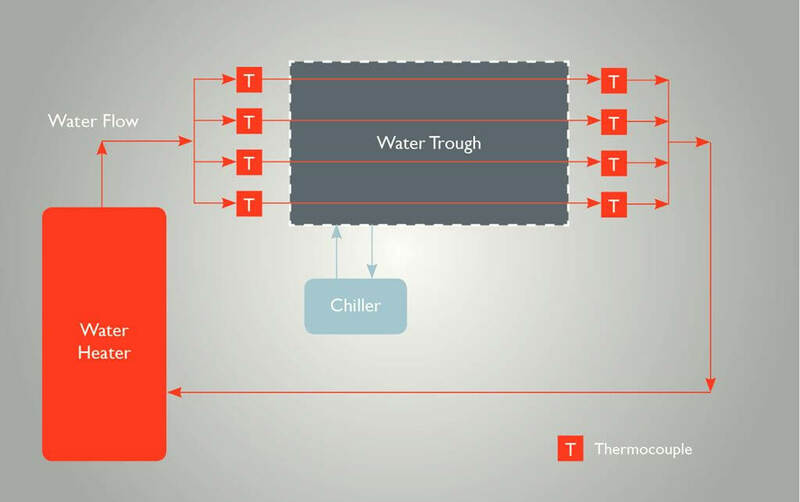 In heated systems, moisture ingress causes convection cells to form within the insulation where water vapor is generated on the steel surface and driven outward. It condenses on the inside of the cooler jacket wall and then is reabsorbed by the insulation in a process known as refluxing. Refluxing leads to concentrations of corrosive species in the insulation. In cooled systems, ingress of water vapor from the surrounding air condenses onto the colder pipe surface and is then absorbed by the insulation closest to the pipe. Since water has approximately 15 times the thermal conductivity of most dry thermal insulation materials, this absorption affects the insulation’s efficiency. Water in the insulating fibers also causes a matting effect where the fibers compress onto one another, negating the insulation benefits associated with the still air pockets within the insulation material. As little as 4% water absorption into dry insulation can increase its thermal conductivity by 70%. This loss in efficiency increases energy consumption where operational temperature variation cannot be tolerated. The financial drain caused by moisture intrusion has left facility owners looking for other insulation options. An alternative to traditional insulation is using an insulating coating. Insulation coatings are not a new technology, but within the last five years insulation coatings containing aerogel have become available. On paper, aerogel-infused coatings can achieve a thermal conductivity on par with most traditional insulation materials, while also resisting the infiltration of moisture. These insulation coatings containing aerogel also have been used in other applications: to control condensation and provide a "safe-touch" barrier to protect personnel from hot equipment. Researchers developed a test that evaluates the thermal performance of various insulation materials before, during, and, most importantly, after being submerged in water. The test consisted of a five-foot trough that could be filled with water and drained. Six-foot-long, 2” diameter copper pipes were insulated with the appropriate materials. Thermocouples were installed on the inlet and outlet of these pipes in order to monitor the individual efficiency of each pipe. The thermocouples recorded the water temperature as it came into the pipe and also as it left the pipe. A water heater pumped 60°C (140°F) water through the copper pipes, and a water chiller was used to maintain the water in the trough at 10°C (50°F) when flooded. This ensured consistency in the water temperatures being circulated through each pipe. Figure 1 is a diagram of the test set up. Figure 1: Thermal performance test set up. Before installing any of the insulation materials, the bare pipes were run dry for several days to establish a baseline and to demonstrate consistency across the various positions in the trough. As expected, heat loss from the pipes increased dramatically when the trough was filled with water. Once the water was drained from the trough, the bare pipes returned to their initial dry performance within a few hours. Figure 2: Test trough with bare copper pipes. In the case of the pipes coated with an aerogel coating system, the copper pipes were prepared according to SSPC-SP2 Hand Tool Cleaning. The pipes then were coated with an epoxy primer. Two coats of the aerogel coating were applied for a total of 100 mils dry film thickness (DFT). The pipe was topcoated with a water-based epoxy. An insulation contractor completed the installation of the mineral wool and cladding after the two pipes were coated with the same epoxy primer. The duplex pipe then had two coats of the aerogel coating applied and both pipes were wrapped with 2” mineral wool. The aluminum cladding was installed over the mineral wool. In all cases, the pipes were weighed before being placed back into the trough to note a baseline weight of the original insulation. All four of the pipes were run side-by-side for two weeks in an empty trough to establish their dry performance. The trough was then filled with water for 24 hours. The performance was again monitored through the thermocouples on both ends. Finally, the trough was drained and the performance was monitored over the next few months while the pipes dried out. Table 1 details the results. Table 1: Test results comparing pipes insulated with aerogel and mineral wool. As expected, the initial dry performance of the mineral wool was significantly better than the aerogel coating. Even though the performance rating of the aerogel coating is slightly better, the mineral wool was installed 20 times thicker than the coating. The test data became interesting once water was introduced into the trough. The heat loss performance was first measured while submerged in water, showing a drastic spike in heat loss on the mineral wool pipe. The submerged data was telling, but the main purpose of the testing was to see how these materials reacted to getting wet and the impact on their long-term performance. Twenty-four hours after draining the water from the trough, the aerogel-coated pipe had returned to its original heat loss performance while the mineral wool struggled to dry out and regain some of its original dry performance. Ultimately, after having a full three months to dry, the mineral wool still was losing five times more heat than its original performance. The drop in performance of the mineral wool is driven by a couple of factors. First, during submersion there was water ingress into the insulation through small leaks in the cladding. The water was absorbed by the fibers and it filled the air pores between the fibers. This effect was evidenced by the weight gain of the systems. The original weight of the mineral wool was 1.4 lbs. ; the weight after being submerged was 10.2 lbs. During the 3-month check, the mineral wool still was 3.3 lbs., which is well over twice its original weight. In higher temperature applications, more of this water will likely evaporate, but while wet, the insulating air inside the mineral wool is displaced by moisture. The last pipe involved in the testing was a duplex system of both materials. This consisted of the same epoxy primer and 100 mils of the aerogel coating followed by 2” of mineral wool and cladding. The dry performance was very similar to the dry performance of the mineral wool, but the performance after being submerged was better. After just 24 hours of drying, this duplex system was more efficient than the aerogel coating by itself, with half the heat loss of the mineral wool pipe. 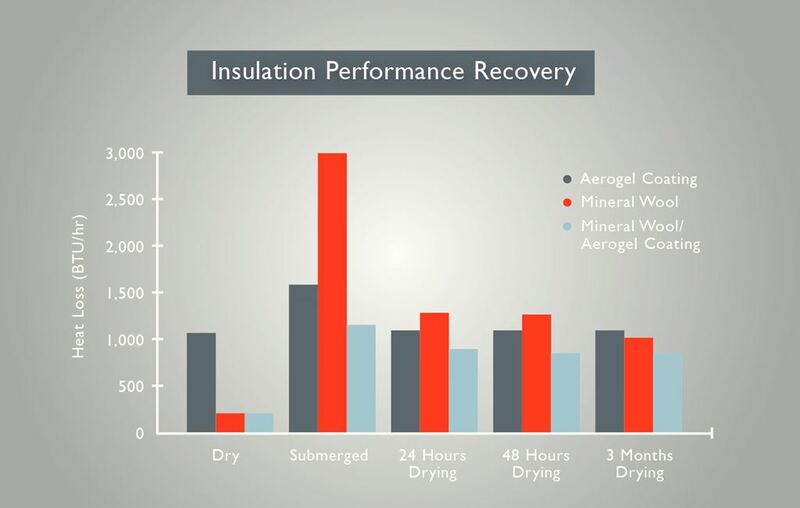 This is due to the fact that the aerogel coating itself is delivering additional performance to the system and helping to overcome the deficiencies of the drying mineral wool. The duplex system that combines the aerogel coating and mineral wool brings superior performance before, during and after exposure to water. The downside of the duplex system in a real-world scenario is the cost and installation of both materials, so a cost-benefit analysis would need to be done to warrant this option. Facilities are doing more every day to minimize potential issues related to CUI. However, the economic impact of energy loss due to wet insulation is often overlooked. It can take several years to detect CUI, during which time the insulation is underperforming and costing the facility owner. An understanding of the financial ramifications of wet and underperforming insulation is a necessary step in not only developing a CUI strategy, but also selecting the proper insulating materials for any given environment. To learn more about aerogel coating systems register here for our free educational webinar. Andy Hoffman, Product Manager of Insulation and Specialty Products with Tnemec Company Inc., covers new product development, management of specialty coating systems, and coordination of their enhancements. Hoffman is well-versed in the insulation market and the attributes of insulating materials.